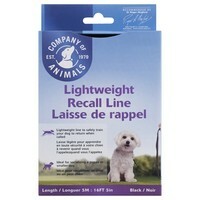 Company of Animals Lightweight Recall Line is an essential aid for recall training. It allows your dog to be seemingly free, yet under control. The lightweight version of the Recall Training Line is ideal for puppies and young dogs as it is made from an ultra light yet durable fabric. A free training guide is included.